Price: £3.80 (incl VAT) Sorry, this item is currently unavailable. Click here to receive notification when this product comes back into stock. 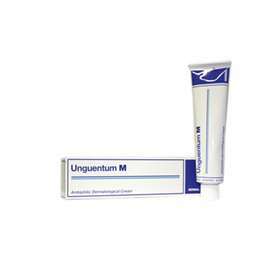 Unguentum M Cream 100g is a blend of Cream and Ointment. It is used to treat dry and damaged skin caused by conditions such as dermatitis, eczema, itchy skin known as pruritus, or dry harsh scaly skin known as ichthyosis. Unguentum M can also be used to help the symptoms of Nappy Rash and can be used instead of soap when washing, which will help prevent the skin drying out. Treats Cracked and Damaged Skin. Helps relieve symptoms of Nappy Rash. Can be used instead of Soap. Use a small amount of the Unguentum M cream and rub it into the affected area. If you apply too much, wash off the extra with water. You should apply this to the affected areas three times a day or as often as you need to. A good time to do this is after you have had a bath. Do not use Unguentum M if you are sensitive to any of the ingredients. Keep all medicines where children cannot see or reach them. If your symptoms do not improve then consult your Doctor or Pharmacist. Purified Water, White Soft Paraffin, Cetostearyl Alcohol, Polysorbate 40, Propylene Glycol, Glyceryl Monostearate 40- 50, Liquid Paraffin, Medium-Chain Triglycerides, Sorbic Acid, Colloidal Anhydrous Silica, Sodium Hydroxide. Product code: 0451195 Price: £3.80 (incl VAT) Sorry, this item is currently unavailable. Click here to receive notification when this product comes back into stock.